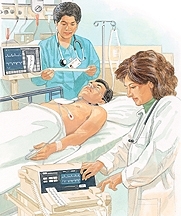 Cardioversion is a procedure to restore the heart’s normal rhythm. You may have the procedure in a hospital or surgery center. It’s often done on an outpatient (same day) basis. During the procedure, you’ll be given medication to keep you free from pain. Then the doctor gives you a brief electric shock. This helps your heartbeat become normal again. In most cases, you can go home the same day as the procedure. Take medication as directed. Your doctor may prescribe anticoagulants (blood thinners) for a few weeks. They help prevent blood clots from forming. Don’t eat or drink anything for 8 hours before your procedure. Small pads (electrodes) are placed on your chest to record your heartbeat at all times. An intravenous (IV) line is placed in your arm. This gives you medication (sedation) that keeps you free of pain. You’ll feel sleepy. You will be given oxygen through a soft plastic tube in your nose. Pads will be placed on your chest and back. A very brief electric shock is given through the pads. Remember, because of sedation you won’t feel the shock. Your heartbeat is watched to make sure the normal rhythm has been restored. You’ll be monitored until you are fully awake. Then you’ll be able to sit up, walk, and eat. For a day, the skin on your chest may feel a little sore, like a mild sunburn.